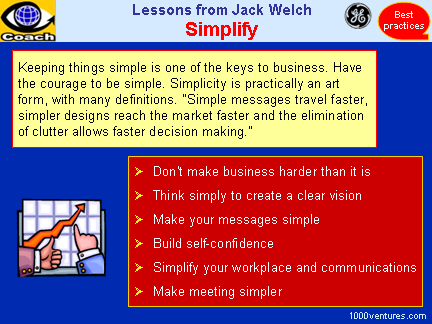 On the Web, simplicity is a necessary condition for survival. If your website is difficult to use, people leave. Keep your website simple and visitors will use it. Rapid growth of → Google due to popularity of its ultra-simple interface is a prime example. "For us, growing up meant figuring out a way to combine our signature informal, entrepreneurial style and "want-do" → attitude with the "can-do" → capabilities that would allow us develop as a company," continues Michael Dell. It meant, in particular, "respecting the three golden rules at Dell: 1) Disdain inventory, 2) Always listen to the customer, and 3) Never → sell indirect. It sounds simple, I know, but some of the best practices are often the simplest. And even the simple practices take time to institute." Henry Ford once remarked that the smarter the engineer the more likely he was to say that something couldn't be done. → Konosuke Matsushita, Founder of Panasonic, had a similar idea about the connection between knowledge and innovation: "We speak of the shortcomings of the purely intellectual approach, but this refers to our wariness of half-baked theories that can prevent us from proceeding to a practical solution. If necessity is the mother of invention, then simple, unaffected determination is its father. Even when everyone around you say it's impossible, if you step back and rethink your task in the simplest possible terms, free of the noise of over-erudite and preconceived notions, often → the solution will come to you, out of the blue, so to speak." For this reason, Matsushita's own lack of formal education was a blessing in disguise, allowing him to see to the heart of problems free of the constraints of academic or unsubstantiated ideas.